In an effort to enhance the fire safety of Miami Township residents the Miami Township Fire & EMS department in cooperation with the American Red Cross, Cincinnati Chapter and local businesses, will provide at no cost, a Smoke Detector and/or a Carbon Monoxide Detector to those in need. If you know of someone in need of these safety devices, please call 248-3700. • An ionization smoke alarm is generally more responsive to flaming fires, and a photoelectric smoke alarm is generally more responsive to smoldering fires. For the best protection, both types of alarms or a combination alarm (photoelectric and ionization) should be installed in homes. • Replace all smoke alarms, including alarms that use 10-year batteries and hard-wired alarms, when they are 10 year old or sooner if they do not respond properly. • Alarms that are hard-wired (and include battery backup) must be installed by a qualified electrician. 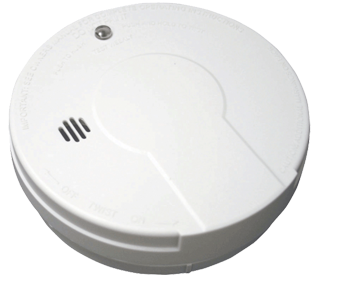 • If cooking fumes or steam sets off nuisance alarms, replace the alarm with an alarm that has a "hush" button. A "hush" button will reduce the alarm’s sensitivity for a short period of time. • An ionization alarm with a hush button or a photoelectric alarm should be used if the alarm is within 20 feet of a cooking appliance. • Smoke alarms that include a recordable voice announcement in addition to the usual alarm sound, may be helpful in waking children through the use of a familiar voice. •Smoke alarms are available for people who are deaf or hard of hearing. These devices use strobe lights. Vibration devices can be added to these alarms.